The Eighty Years' War (Dutch: Tachtigjarige Oorlog; Spanish: Guerra de los Ochenta Años) or Dutch War of Independence (1568–1648) was a revolt of the Seventeen Provinces of what are today the Netherlands, Belgium, and Luxembourg against Philip II of Spain, the sovereign of the Habsburg Netherlands. After the initial stages, Philip II deployed his armies and regained control over most of the rebelling provinces. Under the leadership of the exiled William the Silent, the northern provinces continued their resistance. They eventually were able to oust the Habsburg armies, and in 1581 they established the Republic of the Seven United Netherlands. The war continued in other areas, although the heartland of the republic was no longer threatened; this included the beginnings of the Dutch Colonial Empire, which at the time were conceived as carrying overseas the war with Spain. The Dutch Republic was recognized by Spain and the major European powers in 1609 at the start of the Twelve Years' Truce. Hostilities broke out again around 1619, as part of the broader Thirty Years' War. An end was reached in 1648 with the Peace of Münster (a treaty part of the Peace of Westphalia), when the Dutch Republic was definitively recognised as an independent country no longer part of the Holy Roman Empire. The Peace of Münster is sometimes considered the beginning of the Dutch Golden Age. There are numerous causes that led to the Eighty Years' War but the primary reasons could be classified into two: resentment towards the Spanish authority and religious tension. The first was initially articulated by the Dutch nobility who wanted to regain power and privileges lost in favor of the King, so they settled the thought that Phillip II was surrounded by evil advisors. This eventually developed into an overarching discontent against the absolutist Spanish regime. Religious resistance, on the other hand, came with the imposition of an ecclesiastical hierarchy for all of the Spanish territories. This created resistance in the Dutch provinces, which already embraced the Reformation. In the decades preceding the war, the Dutch became increasingly discontented with Spanish rule. A major concern involved the heavy taxation imposed on the population, while support and guidance from the government was hampered by the size of the Spanish empire. At that time, the Seventeen Provinces were known in the empire as De landen van herwaarts over and in French as Les pays de par deça – "those lands around there". The Dutch provinces were continually criticised for acting without permission from the throne, while it was impractical for them to gain permission for actions, as requests sent to the throne would take at least four weeks for a response to return. The presence of Spanish troops under the command of the Duke of Alba, who was brought in to oversee order, further amplified this unrest. Spain also attempted a policy of strict religious uniformity for the Catholic Church within its domains, and enforced it with the Inquisition. The Reformation meanwhile produced a number of Protestant denominations, which gained followers in the Seventeen Provinces. These included the Lutheran movement of Martin Luther, the Anabaptist movement of the Dutch reformer Menno Simons, and the Reformed teachings of John Calvin. This growth led to the 1566 Beeldenstorm, the "Iconoclastic Fury", in which many churches in northern Europe were stripped of their Catholic statuary and religious decoration. In October 1555, Emperor Charles V of the Holy Roman Empire began the gradual abdication of his several crowns. His son Philip II took over as sovereign of the Habsburg Netherlands, which at the time was a personal union of seventeen provinces with little in common beyond their sovereign and a constitutional framework. This framework, assembled during the preceding reigns of Burgundian and Habsburg rulers, divided power between city governments, local nobility, provincial States, royal stadtholders, the States General of the Netherlands, and the central government (possibly represented by a Regent) assisted by three councils: the Council of State, the Privy Council and the Council of Finances. The balance of power was heavily weighted toward the local and regional governments. Philip II of Spain berating William the Silent, Prince of Orange, by Cornelis Kruseman, painting from 19th century. 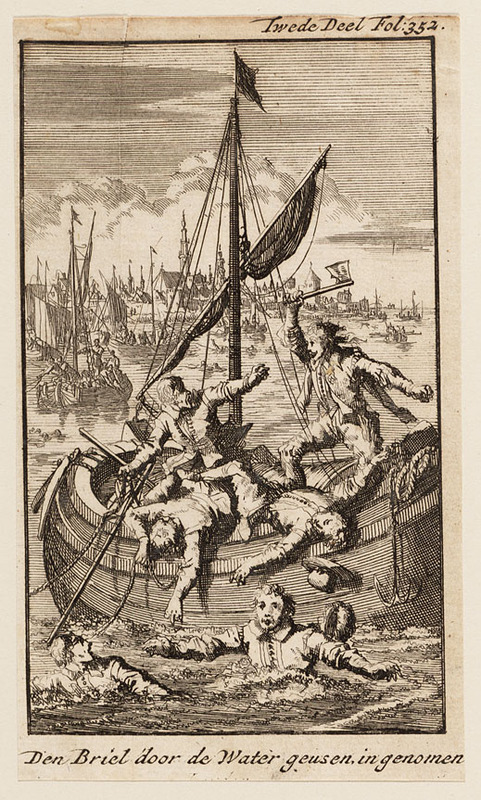 This scene was purported to have happened on the dock in Flushing when Philip departed the Netherlands. Philip did not govern in person but appointed Emmanuel Philibert, Duke of Savoy as governor-general to lead the central government. In 1559 he appointed his half-sister Margaret of Parma as the first Regent, who governed in close co-operation with Dutch nobles like William, Prince of Orange, Philip de Montmorency, Count of Hoorn, and Lamoral, Count of Egmont. Philip introduced a number of councillors in the Council of State, foremost among these Antoine Perrenot de Granvelle, a French-born cardinal who gained considerable influence in the Council, much to the chagrin of the Dutch council members. When Philip left for Spain in 1559 political tension was increased by religious policies. Not having the liberal-mindedness of his father Charles V, Philip was a fervent enemy of the Protestant movements of Martin Luther, John Calvin, and the Anabaptists. Charles had outlawed heresy in special placards that made it a capital offence, to be prosecuted by a Dutch version of the Inquisition, leading to the executions of over 1,300 people between 1523 and 1566. Towards the end of Charles' reign enforcement had reportedly become lax. Philip, however, insisted on rigorous enforcement, which caused widespread unrest. To support and strengthen the attempts at Counter-Reformation Philip launched a wholesale organisational reform of the Catholic Church in the Netherlands in 1559, which resulted in the inclusion of fourteen dioceses instead of the old three. The new hierarchy was to be headed by Granvelle as archbishop of the new archdiocese of Mechelen. The reform was especially unpopular with the old church hierarchy, as the new dioceses were to be financed by the transfer of a number of rich abbeys. Granvelle became the focus of the opposition against the new governmental structures and the Dutch nobles under the leadership of Orange engineered his recall in 1564. After the recall of Granvelle, Orange persuaded Margaret and the Council to ask for a moderation of the placards against heresy. Philip delayed his response, and in this interval the opposition to his religious policies gained more widespread support. Philip finally rejected the request for moderation in his Letters from the Segovia Woods of October 1565. In response, a group of members of the lesser nobility, among whom were Louis of Nassau, a younger brother of Orange, and the brothers John and Philip of St. Aldegonde, prepared a petition for Philip that sought the abolition of the Inquisition. This Compromise of Nobles was supported by about 400 nobles, both Catholic and Protestant, and was presented to Margaret on 5 April 1566. Impressed by the massive support for the compromise, she suspended the placards, awaiting Philip's final ruling. Don Fadrique Álvarez de Toledo was commander of the Spanish troops during part of the Dutch rebellion. Calvinists were an important component of the iconoclastic fury (Dutch: Beeldenstorm) across the Netherlands. Margaret feared insurrection and made further concessions to the Calvinists, such as designating certain churches for Calvinist worship. Some provincial governors took decisive action to quell the disturbances. In March 1567 at the Battle of Oosterweel Calvinists under John of St. Aldegonde were defeated by a royalist army and all rebels summarily executed. In April 1567, Margaret reported to Philip that order had been restored. However, by the time this news reached Philip in Madrid the Duke of Alba had already been dispatched with an army to restore order. Alba took over command and Margaret resigned in protest. Alba established the Council of Troubles (soon to be nicknamed the Blood Council) on 5 September 1567, which conducted a campaign of repression of suspected heretics and people guilty of insurrection. Many high-ranking officials were arrested on various pretexts, among them the Counts of Egmont and Horne who were executed for treason. Of the 9,000 accused, about 1,000 were executed, and many fled into exile, including William of Orange. Orange's exile in Dillenburg became the center for plans to invade the Netherlands. Louis of Nassau crossed into Groningen from East Friesland and defeated a small royalist force at Heiligerlee on 23 May 1568. Two months after, the Dutch rebels were smashed at the Battle of Jemmingen. Shortly thereafter, a Sea Beggars squadron defeated a royalist fleet in a naval battle on the Ems. However, a Huguenot army invading Artois was pushed back into France and annihilated by the forces of Charles IX of France in June. Orange marched into Brabant, but with money running out he could not maintain his mercenary army and had to retreat. Philip was suffering from the high cost of his war against the Ottoman Empire, and ordered Alba to fund his armies from taxes levied in the Netherlands. Alba confronted the States General by imposing sales taxes by decree on 31 July 1571, which alienated even loyal lower governments from the central government. With the potential threat of invasions from France, Alba concentrated his force in the Southern Netherlands, in some cases removing troops from garrisons in the North. This left the port of Brill almost undefended. Sea Beggars expelled from England captured the city on 1 April 1572. The news of the capture of Brill led the cities of Flushing and Veere to go over to the Rebels on 3 May. Orange quickly responded to this new development, by sending a number of emissaries to Holland and Zeeland with commissions to take over local government on his behalf as "stadtholder". Diederik Sonoy persuaded the cities of Enkhuizen, Hoorn, Medemblik, Edam, Haarlem, and Alkmaar to defect to Orange. The cities of Oudewater, Gouda, Gorinchem, and Dordrecht yielded to Lumey. Leiden declared itself for Orange in a spontaneous revolt. The States of Holland started to convene in the rebel city of Dordrecht, and by 18 July, only the important cities of Amsterdam and Schoonhoven openly supported the Crown. Rotterdam went to the rebels soon after the first meetings in Dordrecht. Delft remained neutral for the time being. Count Willem IV van den Bergh, Orange's brother-in-law, captured the city of Zutphen, followed by other cities in Gelderland and neighbouring Overijssel. In Friesland rebels had seized several cities. Louis of Nassau captured Mons by surprise on 24 May. Orange marched to Mons for support, but was forced to withdraw through Mechelen, where he left a garrison. Alba had troops sack Mechelen, after which many cities hastened to pledge renewed loyalty to Alba. After dealing with Orange's threat in the South, Alba sent his son Fadrique to the two rebellious provinces Gelderland and Holland. Fadrique started his campaign by sacking the fortress city of Zutphen in Gelderland. Hundreds of citizens perished and many rebellious cities in Gelderland, Overijssel and Friesland yielded. On his way to Amsterdam, Fadrique came across Naarden and massacred the population on 22 November 1572. In Haarlem the citizens, aware of the fate of Naarden, prevented capitulation and put up a resistance. The city was under siege from December until 13 July 1573, when starvation forced a surrender. The Siege of Alkmaar resulted in a rebel victory after they inundated the surroundings. Oudewater was conquered by the Spanish on 7 August 1575, and most of its inhabitants were killed. In the Battle on the Zuiderzee on 11 October 1573, a Sea Beggar squadron defeated the royalist fleet, thus placing the Zuiderzee under rebel control. The Battle of Borsele and the Battle of Reimerswaal established naval superiority for the rebels in Zeeland, and led to the fall of Middelburg in 1574. In November 1573, Fadrique laid siege to Leiden. Spanish troops meanwhile defeated a mercenary force led by Orange's brothers Louis and Henry of Nassau-Dillenburg in the Mookerheyde. In May 1574, the polders surrounding Leiden were flooded and a Sea Beggar fleet managed to lift the siege on 2 October 1574. Alba was replaced as regent by Requesens. In the summer of 1575, Requesens ordered Cristobal de Mondragon to attack the Zeeland city of Zierikzee, which surrendered on 2 July 1576; however, the Spanish troops mutinied and left Zierikzee. Philip had not been able to pay his troops for two years. The Spanish mutineers marched on Brussels, on the way sacking the city of Aalst. The loyal provinces had reluctantly backed the royal government against the Rebellion so far, but now Philipe de Croÿ, Duke of Aerschot, stadtholder of Flanders allowed the States-General to start peace negotiations with the States of Holland and Zeeland. All agreed that the Spanish troops should be withdrawn. There was also agreement on the suspension of the placards against heresy and freedom of conscience. The Pacification of Ghent was signed after the Spanish mutineers went on a murderous rampage in the city of Antwerp on 4 November. The next regent, Juan de Austria arrived on 3 November, too late to influence events. The States-General induced Juan de Austria's agreement to the Pacification of Ghent in the Perpetual Edict on 12 February 1577. The Spanish troops were withdrawn. Juan broke with the States-General in July, and fled to the safety of the citadel of Namur. Philip's improved finances enabled him to send a new Spanish army from Italy, under Alexander Farnese, Duke of Parma. Parma routed the States-General's troops in the Battle of Gembloux on 31 January 1578, allowing royalist forces to advance to Leuven. New troops raised by the States General with support of Elizabeth of England defeated the Spanish armies at the Rijmenam. Parma became the new governor general after the death of Juan de Austria and took Maastricht on 29 June 1579. The remaining royalist cities in Holland were won over to the rebel cause. The interest of the States of Holland formalised the defensive Union of Utrecht with its eastern and northern neighbour provinces on 23 January 1579. The treaty is often called the "constitution" of the Dutch Republic, providing an explicit framework for the budding Confederation. Catholic Walloon provinces signed their own defensive Union of Arras on 6 January 1579. Grievances of the conservative Catholics against Spain were satisfied and they could make a separate peace in the form of the Treaty of Arras in May 1579, in which they renewed their allegiance to Philip. Meanwhile, Orange and the States-General in Antwerp were less than enthusiastic about the Union of Utrecht. They would far prefer a broader based union, still based on the Pacification and the "religious peace", which both the unions of Utrecht and Arras implicitly rejected. However, by the time of the Treaty of Arras it was clear that the split had hardened, and Orange signed the Union of Utrecht on 3 May 1579 while encouraging the Flemish and Brabant cities in Protestant hands to also join the Union. At this time, on the initiative of Emperor Rudolph II a final attempt was made to attain a general peace between Philip and the States-General in the German city of Cologne. As both sides insisted on mutually exclusive demands these peace talks only served to make the irreconcilability of both parties obvious; there appeared to be no more room for the people who favoured the middle ground, like Count Rennenberg. Rennenberg, a Catholic, now made up his mind to go over to Spain. In March 1580 he called for the provinces in his remit to rise against the "tyranny" of Holland and the Protestants. However, this only served to unleash an anti-Catholic backlash in Friesland and Overijssel. The States of Overijssel were finally convinced to adhere to the Union of Utrecht. Nevertheless, Rennenberg's "treason" posed a severe strategic threat for the Union, especially after Parma sent him reinforcements in June. He managed to capture most of Groningen, Drenthe and Overijssel in the next months. The territory under nominal States-General control was steadily shrinking in other parts also. Parma seized Kortrijk in February 1580. Orange persuaded the States-General to offer sovereignty over the Netherlands to the younger brother of king Henri of France, François, Duke of Anjou and conclude the Treaty of Plessis-les-Tours in September 1580. Anjou arrived in Antwerp in January 1581, where he took an oath to in effect govern as a "constitutional monarch", and was acclaimed by the States-General as Protector of the Netherlands. The secession of the States-General and the area under their nominal control from the Spanish Crown was formalised by the Act of Abjuration of 26 July 1581. The Act intensified the propaganda war between both sides, as it took the form of a manifest, setting out the principles of the Revolt, just as Orange's Apologie in answer to Philip's ban of June 1580, outlawing him, had done. Both documents are redolent of resistance theories that were also disseminated by the Huguenot Monarchomachs. As such they alienated yet another group of moderates. Holland and Zeeland acknowledged Anjou perfunctorily, but mainly ignored him, and of the other members of the Union of Utrecht Overijssel, Gelderland and Utrecht never even recognised him. In Flanders his authority never amounted to much either, which meant that only Brabant fully supported him. Anjou himself concentrated his French troops in the south, unable to stench Parma's inexorable advance. By October 1582, Parma had an army of 61,000 troops available, mostly of high quality. In June 1581 Parma had already captured Orange's own town of Breda, thereby driving a wedge into the territory of the States-General in Brabant. In 1582 he made further advances into Gelderland and Overijssel Rennenberg was ably replaced by Francisco Verdugo, who captured the fortress city of Steenwijk, the key to the north-east of the Netherlands. Anjou attempted to seize power in Flanders and Brabant by way of a military coup. He seized Dunkirk and several other Flemish cities, but in Antwerp the citizens massacred the French troops in the French Fury of 17 January 1583. Anjou left for France in June 1583. Morale in the cities still held by the States-General in the South sagged. Dunkirk and Nieuwpoort fell without a shot to Parma, leaving only Oostende as a major rebel enclave along the coast. Orange now established his headquarters in the Dutch city of Delft in July 1583, followed by the States-General in August. Meanwhile, Parma captured Ypres in April 1584, Bruges in May, and Ghent in September. In this desperate situation Orange started to entertain thoughts of finally accepting the title of Count of Holland. This became moot when Orange was assassinated by Balthasar Gérard on 10 July 1584. The assassination for a while put the States of Holland in disarray, which left the initiative to the much diminished States of Flanders and Brabant in the States-General. The latter were by now getting desperate as they controlled only slivers of their provinces (Parma had by now put Antwerp under siege). They believed that their only succour could come from France. On their behest the States-General therefore started a debate on the merit of once more offering sovereignty to king Henri III of France in September, and over Hooft's and Amsterdam's objections a Dutch embassy was sent to France in February 1585. But the situation in France had deteriorated, the religious strife between Huguenots and Catholics flaring up again, and Henri did not feel strong enough to defy Philip, so he declined the honour. Brussels surrendered to Parma in March 1585. After a Dutch amphibious assault (during which an attempt was made to blow up a ship-bridge blocking the Scheldt river with the use of "Hellburners") failed in April, besieged Antwerp surrendered in August. Many Protestants fled to the northern provinces causing the economic strength of the reconquered provinces to steadily decline, while that of Holland and Zeeland mightily increased. The States-General now offered the English queen Elizabeth I sovereignty. Elizabeth instead decided to extend an English protectorate over the Netherlands, sending an expeditionary force of 6,350-foot and 1,000 horse under Robert Dudley, 1st Earl of Leicester, to act as governor-general. In the Council of State, the English would have two voting members. The fortress ports of Flushing and Brill would be an English surety. The States-General agreed to this in the Treaty of Nonsuch of 20 August 1585, the first time the rebel state was diplomatically recognised by a foreign government. Dutch regents, led by the Land's Advocate of Holland, Johan van Oldenbarnevelt, opposed Leicester but he was supported by hard-line Calvinists, the Dutch nobility, and factions in the other provinces, such as Utrecht and Friesland, that heartily resented Holland's supremacy. In Friesland and Groningen William Louis, Count of Nassau-Dillenburg was appointed stadtholder, and in Utrecht, Gelderland and Overijssel Adolf van Nieuwenaar. Holland and Zeeland appointed the second legitimate son of Orange, Maurice of Nassau, stadtholder just before Leicester arrived. This limited Leicester's authority. Leicester also clashed with Holland over matters of policy like the representation of the States of Brabant and Flanders, who by now no longer controlled any significant areas in their provinces, in the States-General. From 1586 on they were barred from taking part in the deliberations over Leicester's objection, though he managed to retain their seats in the Council of State for them. Once the States-General were thus deprived of the membership of the last Southern provinces, one may in effect start using the name Dutch Republic for the new state. In January 1587 the English garrisons at Deventer and Zutphen were bribed to defect to Spain, followed by those in Zwolle, Arnhem and Ostend. This contributed to anti-English feeling. Leicester occupied Gouda, Schoonhoven and a few other cities in September 1587, but eventually gave up and returned to England in December 1587. Thus ended the last attempt to keep the Netherlands a "mixed monarchy", under foreign government. The northern provinces now entered a period of more than two centuries of republican government. The new republic strongly increased its trade and wealth from 1585 onwards, with Amsterdam replacing Antwerp as the main port of north-west Europe. When Adolf of Nieuwenaar died in a gunpowder explosion in October 1589, Oldenbarnevelt engineered Maurice to be appointed stadtholder of Utrecht, Gelderland and Overijssel. Oldenbarnevelt managed to wrest power away from the Council of State, with its English members. Instead, military decisions were more and more made by the States-General with its preponderant influence of the Hollandic delegation. Henry IV of France's succession to the French throne in 1589 occasioned a new civil war in France, in which Philip soon intervened on the Catholic side, offering the Dutch a respite from Parma's relentless pressure. Under the two stadtholders, Maurice and William Louis, the Dutch army was in a short time thoroughly reformed from an ill-disciplined, ill-paid rabble of mercenary companies from all over Protestant Europe, to a well-disciplined, well-paid professional army, with many soldiers, skilled in the use of modern fire-arms, like arquebuses, and soon the more modern muskets. The use of these fire-arms required tactical innovations like the counter-march of files of musketeers to enable rapid volley fire by ranks; such complicated manoevres had to be instilled by constant drilling. These reforms were later emulated by other European armies in the 17th century. They also developed a new approach to siege warfare, assembling an impressive train of siege artillery, taking the offensive in 1591. Already in 1590 Breda was recaptured with a ruse. But the next year Maurice used his much enlarged army with newly developed transportation methods using rivercraft, to sweep the IJssel-river valley, capturing Zutphen and Deventer; then invade the Ommelanden in Groningen, capturing all Spanish forts; and ending the campaign with the conquest of Hulst in Flanders and Nijmegen in Gelderland. In one fell swoop this transformed the eastern part of the Netherlands, which had hitherto been in Parma's hands. The next year Maurice joined his cousin William Louis in the taking Steenwijk and the formidable fortress of Coevorden. Drenthe was now brought under control of the States-General. In June 1593 Geertruidenberg would be captured and in 1594 Groningen. The province of Groningen, City and Ommelanden, was now admitted to the Union of Utrecht, as the seventh voting province. Drenthe was made a separate province with its own States and stadtholder (again William Louis), though Holland blocked its getting a vote in the States-General. The fall of Groningen also changed the balance of forces in the German county of East Friesland, where the Lutheran Count of East Frisia, Edzard II, was opposed by the Calvinist forces in Emden. The States-General now laid a garrison in Emden, forcing the Count to recognise them diplomatically in the Treaty of Delfzijl of 1595. This also gave the Republic a strategic interest in the Ems River valley, which was reinforced during the stadtholders' large offensive of 1597. Maurice first seized the fortress of Rheinberg, a strategic Rhine crossing, and subsequently Groenlo, Oldenzaal, and Enschede, before capturing the county of Lingen. The end of Spanish-French hostilities after the Peace of Vervins of May 1598 would free the Army of Flanders again for operations in the Netherlands. Soon after, Philip died and bequeathed the Netherlands to his daughter Isabella and her husband Archduke Albert, who would henceforth reign as co-sovereigns. This sovereignty was largely nominal as the Army of Flanders was to remain in the Netherlands, largely paid for by the new king of Spain, Philip III. Ceding the Netherlands offered a prospect of peace, as both the Archdukes, and the chief minister of the new king, the duke of Lerma were less inflexible toward the Republic than Philip II had been. Secret negotiations proved abortive because Spain insisted on two points that were nonnegotiable to the Dutch: recognition of the sovereignty of the Archdukes (though they were ready to accept Maurice as their stadtholder in the Dutch provinces) and freedom of worship for Catholics in the north. The Republic was too insecure internally (the loyalty of the recently conquered areas being in doubt) to accede on the latter point. Groenlo relieved by Spinola, November 1606. Maurice's army (right) sounds the retreat. However, peace with France and the secret peace negotiations had temporarily slackened Spain's resolve to pay its troops adequately and this had occasioned the usual widespread mutinies. The Army of Flanders now temporarily in disarray, Oldenbarnevelt forced a deep strike into Flanders on a reluctant Maurice in the direction of the port of Dunkirk that had grown into a hotbed of Dunkirkers, privateers that did enormous damage to Dutch shipping. Maurice now flung his model army into Flanders after a large amphibious operation from Flushing and started his advance along the coast. This incursion ended the mutiny, enabling Albert to launch a strike into Maurice's flank. Maurice was now cornered by Albert near the port of Nieuwpoort and forced to give battle on 2 July 1600, a tactical draw, after which he abandoned his offensive. A privateer fleet managed to break the blockade of Dunkirk and wreaked havoc on the Dutch herring fleet soon, destroying 10% of the fleet of Dutch Herring Busses in August. The next four years showed an apparent stalemate. The Archdukes decided that before taking on the Republic it was important to subdue the last Protestant enclave on the Flemish coast, the port of Ostend. The siege took three years and eighty days. Meanwhile, the stadtholders mopped up some more Spanish fortresses, like Grave in Brabant and Sluys and Aardenburg in what was to become States Flanders. Though these victories deprived the Archdukes of much of the propaganda value of their own victory at Ostend, the loss of the city was a severe blow to the Republic, and it brought about another Protestant exodus to the North. The supreme command of the Army of Flanders had now been transferred to Ambrosio Spinola who proved to be a worthy opponent of Maurice. In a brilliant campaign in 1605 he first outwitted Maurice by feigning an attack on Sluys, leaving Maurice far in his rear while he actually attacked the eastern Netherlands by way of Münster, Germany. He soon appeared before Oldenzaal (only recently captured by Maurice) and the predominantly Catholic city opened its gates without firing a shot. Next he captured Lingen. The Dutch had to evacuate Twenthe and retire to the IJssel river. Spinola returned the next year and caused a panic in the Republic when he invaded the Zutphen quarter of Gelderland, showing that the interior of the Republic was still vulnerable to Spanish attack. However, Spinola was satisfied with the psychological effect of his incursion and did not press the attack. Maurice decided on a rare autumn campaign in an attempt to close the apparent gap in the Republic's eastern defences. He retook Lochem, but his siege of Oldenzaal failed in November 1606. This was the last major campaign on both sides before the Truce that was concluded in 1609. Both sides now embarked on an intensification of the fortress-building spree that had begun in the mid-1590s, enveloping the Republic in a double belt of fortresses on its outer borders (an outer Spanish and an inner Dutch belt). The Dutch fortresses, mostly outside the provinces of the Union of Utrecht proper, were garrisoned with mercenary troops that, though paid for the account of individual provinces, were under federal command since 1594. The Dutch Staatse leger (States Army) had therefore become a truly federal army, consisting mostly of Scottish, English, German and Swiss mercenaries, but commanded by a Dutch officer corps. This standing army almost trebled in size to 50,000 between 1588 and 1607. The military upkeep and decreased trade had put both Spain and the Dutch Republic under financial strain. To alleviate conditions, a ceasefire was signed in Antwerp on 9 April 1609, marking the end of the Dutch Revolt and the beginning of the Twelve Years' Truce. The conclusion of this Truce was a major diplomatic coup for Holland's advocate Johan van Oldenbarnevelt, as Spain by concluding the Treaty, formally recognized the independence of the Republic. In Spain the truce was seen as a major humiliation – she had suffered a political, military and ideological defeat, and the affront to its prestige was immense. The closure of the river Scheldt to traffic in and out of Antwerp, and the acceptance of Dutch commercial operations in the Spanish and Portuguese colonial maritime lanes were just a few points that the Spanish found objectionable. Although there was peace on an international level, political unrest took hold of Dutch domestic affairs. What had started as a theological quarrel resulted in riots between Remonstrants (Arminians) and Counter-Remonstrants (Gomarists). In general, regents would support the former and civilians the latter. Even the government got involved, with Oldenbarnevelt taking the side of the Remonstrants and stadtholder Maurice of Nassau their opponents. In the end, the Synod of Dort condemned the Remonstrants for heresy and excommunicated them from the national Public Church. Van Oldenbarnevelt was sentenced to death, together with his ally Gilles van Ledenberg, while two other Remonstrant allies, Rombout Hogerbeets and Hugo Grotius received life imprisonment. Van Oldenbarnevelt had no ambition to have the Republic become the leading power of Protestant Europe, and he had shown admirable restraint when, in 1614, the Republic had felt constrained to intervene militarily in the Jülich-Cleves crisis opposite Spain. Though there had been a danger of armed conflict between the Spanish and Dutch forces involved in the crisis, both sides took care to avoid each other, respecting each other's spheres of influence. The new regime in The Hague felt differently, however. While civil war was avoided in the Republic, a civil war did start in the Bohemian Kingdom with the Second defenestration of Prague on 23 May 1618. The Bohemian insurgents were now pitted against their king, Ferdinand, who would soon succeed his uncle Matthias (the former States General governor-general of the Netherlands) as Holy Roman Emperor. They cast about for support in this struggle and on the Protestant side only the Republic was able and willing to provide it. This took the form of support for Frederick V, Elector Palatine, a nephew of Prince Maurice and a son-in-law of James I, when Frederick accepted the Crown of Bohemia the insurgents offered him (he was crowned on 4 November 1619). His father-in-law had sought to restrain him from doing this, warning that he could not count on English aid, but Maurice encouraged him in every way, providing a large subsidy and promising Dutch armed assistance. The Dutch had therefore a large role in precipitating the Thirty Years' War. Maurice's motivation was the desire to manoeuvre the Republic into a better position should the war with Spain resume after the expiration of the Truce in 1621. Renewal of the Truce was a distinct possibility, but it had become less likely, as both in Spain and in the Republic more hard-line factions had come to power. Though civil war had been avoided in the Republic, national unity had been bought with much bitterness on the losing Remonstrant side, and Maurice for the moment had to garrison several former Remonstrant-dominated cities to guard against insurrection. This encouraged the Spanish government, perceiving internal weakness in the Republic, to choose a bolder policy in the Bohemian question than they otherwise might have done. The Bohemian war therefore soon degenerated into a proxy war between Spain and the Republic. Even after the Battle of White Mountain of November 1620, which ended disastrously for the Protestant army (one-eighth of which was in the Dutch pay), the Dutch continued to support Frederick militarily, both in Bohemia and in the Palatinate. Maurice also provided diplomatic support, pressing both the Protestant German princes and James I to come to Frederick's aid. When James sent 4,000 English troops in September 1620, those were armed and transported by the Dutch, and their advance covered by a Dutch cavalry column. In the end the Dutch intervention was in vain. After just a few months, Frederick and his wife Elizabeth fled into exile at The Hague, where they became known as the Winter King and Queen for their brief reign. Maurice pressed Frederick in vain to at least defend the Palatinate against the Spanish troops under Spinola and Tilly. This round of the war went to Spain and the Imperial forces in Germany. James held this against Maurice for his incitement of the losing side with promises that he could not keep. There was continual contact between Maurice and the government in Brussels during 1620 and 1621 regarding a possible renewal of the Truce. Archduke Albert of Austria, who had first become Governor General of the Habsburg Netherlands, then, following his marriage to Isabella Clara Eugenia, the daughter of King Philip II, together with his wife its sovereign, was in favour of a renewal, especially after Maurice falsely gave him the impression that a peace would be possible on the basis of a token recognition by the Republic of the sovereignty of the king of Spain. When Albert sent the chancellor of Brabant, Petrus Peckius, to The Hague to negotiate with the States General on this basis, he fell into this trap and innocently started talking about this recognition, instantly alienating his hosts. Nothing was as certain to unite the northern provinces as the suggestion that they should abandon their hard-fought sovereignty. If this incident had not come up, the negotiations might well have been successful as a number of the provinces were amenable to simply renewing the Truce on the old terms. Now the formal negotiations were broken off, however, and Maurice was authorised to conduct further negotiations in secret. His attempts to get a better deal met with counter-demands from the new Spanish government for more substantive Dutch concessions. The Spaniards demanded Dutch evacuation of the West and East Indies; lifting of the restrictions on Antwerp's trade by way of the Scheldt; and toleration of the public practice of the Catholic religion in the Republic. These demands were unacceptable to Maurice and the Truce expired in April 1621. The war did not immediately resume, however. Maurice continued sending secret offers to Isabella after Albert had died in July 1621, through the intermediary of the Flemish painter and diplomat Peter Paul Rubens. Though the contents of these offers (which amounted to a version of the concessions demanded by Spain) were not known in the Republic, the fact of the secret negotiations became known. Proponents of restarting the war were disquieted, like the investors in the Dutch West India Company, which after a long delay was finally about to be founded, with a main objective of bringing the war to the Spanish Americas. Opposition against the peace feelers therefore mounted, and nothing came of them. Another reason the war did not immediately resume was that king Philip III died shortly before the Truce ended. He was succeeded by his 16-year-old son Philip IV, and the new government under Gaspar de Guzmán, Count-Duke of Olivares had to get settled. The view in the Spanish government was that the Truce had been ruinous to Spain in an economic sense. In this view the Truce had enabled the Dutch to gain very unequal advantages in the trade with the Iberian Peninsula and the Mediterranean, owing to their mercantile prowess. On the other hand, the continued blockade of Antwerp had contributed to that city's steep decline in importance (hence the demand for the lifting of the closing of the Scheldt). The shift in the terms of trade between Spain and the Republic had resulted in a permanent trade deficit for Spain, which naturally translated into a drain of Spanish silver to the Republic. The Truce had also given further impetus to the Dutch penetration of the East Indies, and in 1615 a naval expedition under Joris van Spilbergen had raided the West-Coast of Spanish South-America. Spain felt threatened by these incursions and wanted to put a stop to them. Finally, the economic advantages had given the Republic the financial wherewithal to build a large navy during the Truce and to enlarge its standing army to a size where it could rival the Spanish military might. This increased military power appeared to be directed principally to thwart Spain's policy objectives, as witnessed by the Dutch interventions in Germany in 1614 and 1619, and the Dutch alliance with the enemies of Spain in the Mediterranean, like Venice and the Sultan of Morocco. The three conditions Spain had set for a continuation of the Truce had been intended to remedy these disadvantages of the Truce (the demand for freedom of worship for Catholics being made as a matter of principle, but also to mobilise the still sizeable Catholic minority in the Republic and so destabilise it politically). Despite the unfortunate impression the opening speech of chancellor Peckius had made at the negotiations about the renewal of the Truce, the objective of Spain and the regime in Brussels was not a war of reconquest of the Republic. Instead the options considered in Madrid were either a limited exercise of the force of weapons, to capture a few of the strategic points the republic had recently acquired (like Cleves), combined with measures of economic warfare, or reliance on economic warfare alone. Spain opted for the first alternative. Immediately after the expiration of the Truce in April 1621, all Dutch ships were ordered out of Spanish ports and the stringent trade embargoes of before 1609 were renewed. After an interval to rebuild the strength of the Army of Flanders Spinola opened a number of land offensives, in which he captured the fortress of Jülich (garrisoned by the Dutch since 1614) in 1622, and Steenbergen in Brabant, before laying siege to the important fortress city of Bergen-op-Zoom. This proved a costly fiasco as Spinola's besieging army of 18,000 melted away through disease and desertion. He therefore had to lift the siege after a few months. The strategic import of this humiliating experience was that the Spanish government now concluded that besieging the strong Dutch fortresses was a waste of time and money and decided to henceforth solely depend on the economic warfare weapon. The subsequent success of Spinola's siege of Breda did not change this decision, and Spain adopted a defensive stance militarily in the Netherlands. However, the economic warfare was intensified in a way that amounted to a veritable siege of the Republic as a whole. In the first place, the naval war intensified. The Spanish navy harassed Dutch shipping, which had to sail through the Strait of Gibraltar to Italy and the Levant, thereby forcing the Dutch to sail in convoys with naval escorts. The cost of this was borne by the merchants in the form of a special tax, used to finance the Dutch navy, but this increased the shipping rates the Dutch had to charge, and their maritime insurance premiums also were higher, thus making Dutch shipping less competitive. Spain also increased the presence of its navy in Dutch home waters, in the form of the armada of Flanders, and the great number of privateers, the Dunkirkers, both based in the Southern Netherlands. Though these Spanish naval forces were not strong enough to contest Dutch naval supremacy, Spain waged a very successful Guerre de Course, especially against the Dutch herring fisheries, despite attempts by the Dutch to blockade the Flemish coast. The herring trade, an important pillar of the Dutch economy, was hurt much by the other Spanish forms of economic warfare, the embargo on salt for preserving herring, and the blockade of the inland waterways to the Dutch hinterland, which were an important transportation route for Dutch transit trade. The Dutch were used to procuring their salt from Portugal and the Caribbean islands. Alternative salt supplies were available from France, but the French salt had a high magnesium content, which made it less suitable for herring preservation. When the supplies in the Spanish sphere of influence were cut off, the Dutch economy was therefore dealt a heavy blow. The salt embargo was just a part of the more general embargo on Dutch shipping and trade that Spain instituted after 1621. The bite of this embargo grew only gradually, because the Dutch at first tried to evade it by putting their trade in neutral bottoms, like the ships of the Hanseatic League and England. Spanish merchants tried to evade it, as the embargo also did great harm to Spanish economic interests, even to the extent that for a time a famine threatened in Spanish Naples when the Dutch-carried grain trade was cut off. Realizing that the local authorities often sabotaged the embargo, the Spanish crown built up an elaborate enforcement apparatus, the Almirantazgo de los países septentrionales (Admiralty of the northern countries) in 1624 to make it more effective. Part of the new system was a network of inspectors in neutral ports who inspected neutral shipping for goods with a Dutch connection and supplied certificates that protected neutral shippers against confiscation in Spanish ports. The English and Hanseatics were only too happy to comply, and so contributed to the effectiveness of the embargo. The embargo grew to an effective direct and indirect impediment for Dutch trade, as not only the direct trade between the Amsterdam Entrepôt and the lands of the Spanish empire was affected, but also the parts of Dutch trade that indirectly depended on it: Baltic grain and naval stores destined for Spain were now provided by others, depressing the Dutch trade with the Baltic area, and the carrying trade between Spain and Italy now shifted to English shipping. The embargo was a double-edged sword, however, as some Spanish and Portuguese export activities likewise collapsed as a consequence (such as the Valencian and Portuguese salt exports). Spain was also able to physically close off inland waterways for Dutch river traffic after 1625. The Dutch were thus also deprived of their important transit trade with the neutral Prince-Bishopric of Liège (then not a part of the Southern Netherlands) and the German hinterland. Dutch butter and cheese prices collapsed as a result of this blockade (and rose steeply in the affected import areas), as did wine and herring prices (the Dutch monopolised the French wine trade at the time). The steep price rises in the Spanish Netherlands were sometimes accompanied by food shortages, however, leading to an eventual relaxation of this embargo. It was eventually abandoned, because it deprived the Brussels authorities from important revenues from custom duties. The economic warfare measures of Spain were effective in the sense that they depressed economic activity in the Netherlands, thereby also depressing Dutch fiscal resources to finance the war effort, but also by structurally altering European trade relations, at least until the end of the war, after which they reverted in favour of the Dutch. Neutrals benefited, but both the Dutch and the Spanish areas suffered economically, though not uniformly, as some industrial areas benefited from the artificial restriction of trade, which had a protectionist effect. The "new draperies" textile industry in Holland permanently lost terrain to its competitors in Flanders and England, though this was compensated for by a shift to more expensive high-quality woollens. Nevertheless, the economic pressure and the slump of trade and industry it caused was not sufficient to bring the Republic to its knees. There were a number of reasons for this. The chartered companies, the United East India Company (VOC) and the Dutch West India Company (WIC), provided employment on a large enough scale to compensate for the slump in other forms of trade and their trade brought great revenues. Supplying the armies, both in the Netherlands and in Germany, proved a boon for the agricultural areas in the Dutch inland provinces. The fiscal situation of the Dutch government also improved after the death of Maurice in 1625. He had been too successful in gathering all reins of government in his own hands after his coup in 1618. He completely dominated Dutch politics and diplomacy in his first years afterwards, even monopolising the abortive peace talks before the expiration of the Truce. Likewise the political Counter-Remonstrants were temporarily in total control, but the downside was that his government was overextended, with too few people doing the heavy lifting at the local level, which was essential to make the government machine run smoothly in the highly decentralised Dutch polity. Holland's conventional role as leader of the political process was temporarily vacated, as Holland as a power center was eliminated. Maurice had to do everything by himself with his small band of aristocratic managers in the States General. This situation deteriorated even more when he had to spend long periods in the field as commander-in-chief, during which he was unable to personally direct affairs in The Hague. His health soon deteriorated, also detracting from his efficacy as a political and military leader. The regime, depending on Maurice's personal qualities as a virtual dictator, therefore came under unbearable strain. Not surprisingly, in the period up to his death the strategic and military position of the Republic deteriorated. It had to increase the standing army to 48,000 men in 1622, just to hold the defensive ring of fortresses, while Spain increased the Army of Flanders to 60,000 men at the same time. This put a great strain on the Republic's finances at a time when tax rates were already dangerously high. Yet at the same time the Republic had no other option than to sustain the imploding German Protestant forces financially. For that reason the Dutch paid for the army of Count Ernst von Mansfeld that was cowering against the Dutch border in East Friesland after its defeats against the Spanish and Imperial forces; it was hoped that in this way a complete encirclement of the Republic could be avoided. For a while the Republic pinned its hope on Christian the Younger of Brunswick. However, his Dutch-financed army was crushed at Stadtlohn, near the Dutch border by the forces of the Catholic League under Tilly in August 1623. This setback necessitated a reinforcement of the Dutch IJssel line. Spinola, however, failed to take advantage of the new situation, lulled into complacency by Maurice's unceasing peace-feelers. He was back in 1624, however, besieging Breda, and Dutch morale slumped, despite the diplomatic success of the Treaty of Compiègne with Louis XIII of France, in which the latter agreed to support the Dutch military effort with an annual subsidy of a million guilders (7% of the Dutch war budget). Maurice died in April 1625, aged 58, and was succeeded as Prince of Orange and captain-general of the Union by his half-brother Frederick Henry, Prince of Orange. It took several months, however, to obtain his appointment as stadtholder of Holland and Zeeland, as it took time to agree on the terms of his commission. This deprived the regime of leadership in a crucial time. During this time the moderate Calvinist regents staged a return in Holland at the expense of the radical Counter-Remonstrants. This was an important development, as Frederick Henry could not lean exclusively on the latter faction, but instead took a position "above the parties", playing the two factions against one another. A side effect of this was that more normal political relations returned to the Republic, with Holland returning to its central political position. Also, the persecution of the Remonstrants now abated with the Prince's connivance, and with this renewed climate of tolerance, political stability in the Republic also improved. This improvement in internal affairs helped the Republic overcome the difficult years of the sharpest economic warfare phase. During the lull in the military pressure by Spain after the fall of Breda in 1625, the Republic was able to steadily increase its standing army, owing to its improved financial situation. This enabled the new stadtholder of Friesland and Groningen, Ernst Casimir, to recapture Oldenzaal, forcing the Spanish troops to evacuate Overijssel. Diplomatically, the situation improved once England entered the war in 1625 as an ally. Frederick Henry cleared the Spaniards from eastern Gelderland in 1627 after recapturing Grol. The Dutch victory in the Battle in the Bay of Matanzas in 1628, in which a Spanish treasure fleet was captured by Piet Pieterszoon Hein, contributed even more to the improving fiscal situation, at the same time depriving Spain of much needed money. However, the greatest contribution to the improvement of the Dutch position in 1628 was that Spain had overextended itself again when it participated in the War of the Mantuan Succession. This caused such a depletion of Spanish troops and financial resources in the theatre of war in the Netherlands that the Republic for the time being achieved a strategic superiority: the Army of Flanders declined to 55,000 men while the States Army reached 58,000 in 1627. Meanwhile, the Imperial forces had surged in Germany after the initial setback from the intervention of Christian IV of Denmark in the war in 1625. Both the Danes and Mansfelt were defeated in 1626, and the Catholic League occupied the northern German lands that had hitherto acted as a buffer zone for the Republic. For a while in 1628 an invasion of the eastern part of the Republic seemed imminent. However, the relative might of Spain, the main player up to now in the German civil war, was ebbing fast. By April 1629 the States Army counted 77,000 soldiers, half as much again as the Army of Flanders at that point in time. This allowed Frederick Henry to raise a mobile army of 28,000 (the other troops were used in the fixed garrisons of the Republic) and invest 's-Hertogenbosch. During the siege of this strategic fortress city the imperialist and Spanish allies launched a diversionary attack from Germany's IJssel line. After crossing this river, they invaded the Dutch heartland, getting as far as the city of Amersfoort, which promptly surrendered. The States General, however, mobilised civic militias and scrounged garrison troops from fortresses all around the country, assembling an army that at the height of the emergency numbered no less than 128,000 troops. This enabled Frederick Henry to maintain his siege of 's-Hertogenbosch. When Dutch troops surprised the Spanish fortress of Wesel, which acted as the principal Spanish supply base, this forced the invaders to retreat to the IJssel. 's-Hertogenbosch surrendered in September 1629 to Frederick Henry. The loss of Wesel and 's-Hertogenbosch (a city that had been fortified according to the most modern standards, often incorporating Dutch innovations in fortification), in short succession, caused a sensation in Europe. It demonstrated that the Dutch, for the moment, enjoyed strategic superiority. 's-Hertogenbosch was the linchpin of the ring of Spanish fortifications in Brabant; its loss left a gaping hole in the Spanish front. Thoroughly shaken, Philip IV now overruled Olivares and offered an unconditional truce. The States General refused to consider this offer until the Imperial forces had left Dutch territory. Only after this had been accomplished did they remit the Spanish offer to the States of the provinces for consideration. The popular debate that followed split the provinces. Friesland, Groningen and Zeeland, predictably, rejected the proposal. Frederick Henry appears to have favoured it personally, but he was hampered by the political divisions in the province of Holland where radical Counter-Remonstrants and moderates were unable to agree. The Counter-Remonstrants urged in guarded terms a final eradication of "Remonstrant" tendencies in the Republic (thus establishing internal "unity") before a truce could even be considered. The radical Calvinist preachers urged a "liberation" of more of the Spanish Netherlands. Shareholders in the WIC dreaded the prospect of a truce in the Americas, which would thwart the plans of that company to stage an invasion of Portuguese Brazil. The peace party and the war party in the States of Holland therefore perfectly balanced each other and deadlock ensued. Nothing was decided during 1629 and 1630. To break the deadlock in the States of Holland, Frederick Henry planned a sensational offensive in 1631. He intended to invade Flanders and make a deep thrust toward Dunkirk, like his brother had done in 1600. His expedition was even larger. He embarked 30,000 men and 80 field guns on 3,000 rivercraft for his amphibious descent on IJzendijke. From there he penetrated to the Bruges-Ghent canal that the Brussels government had dug to circumvent the Dutch blockade of the coastal waters. Unfortunately, at this stage a sizeable Spanish force appeared to his rear, which caused a row with panicky deputies-in-the-field that, as usual, were micro-managing the campaign for the States General. The civilians prevailed, and a very angry Frederick Henry had to order an ignominious retreat of the Dutch invading force. Finally, in 1632, Frederick Henry was allowed to deliver his death blow. The initial move in his offensive was to have a reluctant States General publish (over the objections of the radical Calvinists) a proclamation promising that the free exercise of the Catholic religion would be guaranteed in places that the Dutch army would conquer that year. The inhabitants of the Southern Netherlands were invited to "throw off the yoke of the Spaniards". This piece of propaganda would prove to be very effective. Frederick Henry now invaded the Meuse valley with 30,000 troops. He took Venlo, Roermond and Sittard in short order. As promised, the Catholic churches and clergy were left unmolested. Then, on 8 June, he laid siege to Maastricht. A desperate effort of Spanish and Imperialist forces to relieve the city failed and on 20 August 1632, Frederick Henry sprang his mines, breaching the walls of the city. It capitulated three days later. Here also, the Catholic religion was allowed to remain. The infanta Isabella was now forced to convene the southern States General for the first time since her inauguration in 1598. They met in September (as it turned out for the last time under Spanish rule). Most southern provinces advocated immediate peace talks with the Republic so as to preserve the integrity of the South and the free exercise of the Catholic religion. A "southern" States General delegation met the "northern" States General, represented by its deputies-in-the-field in Maastricht. The "southern" delegates offered to negotiate on the strength of the authorisation given in 1629 by Philip IV. However, Philip and Olivares secretly cancelled this authorisation, as they considered the initiative of the southern States General an "usurpation" of royal power. They never intended to honour any agreement that might ensue. On the Dutch side, there was the usual disunity. Frederick Henry hoped to achieve a quick result, but Friesland, Groningen and Zeeland opposed the talks outright, while divided Holland dithered. Eventually, those four provinces authorised talks with only the southern provinces, leaving Spain out. Evidently, such an approach would make the resulting agreement worthless, as only Spain possessed any troops. The peace party in the Republic finally brought about meaningful negotiations in December 1632, when valuable time had already been lost, enabling Spain to send reinforcements. Both sides presented demands that were irreconcilable at first, but after much palaver the southern demands were reduced to the evacuation of Portuguese Brazil (which had been invaded by the WIC in 1630) by the Dutch. In return, they offered Breda and an indemnity for the WIC for giving up Brazil. The Dutch (over the opposition of the war party that considered the demands too lenient) reduced its demands to Breda, Geldern, and the Meierij area around 's-Hertogenbosch, in addition to tariff-concessions in the South. Furthermore, as they realised that Spain would never concede Brazil, they proposed to limit the peace to Europe, continuing the war overseas. By June 1633 the talks were on the verge of collapse. A shift in Dutch politics ensued that would prove fateful for the Republic. Frederick Henry, sensing that the talks were going nowhere, proposed to put an ultimatum to the other side to accept the Dutch demands. However, he lost the support of the "peace party" in Holland, led by Amsterdam. These regents wanted to offer further concessions to gain peace. The peace party gained the upper hand in Holland, for the first time since 1618 standing up to the stadtholder and the Counter-Remonstrants. Frederick Henry, however, managed to gain the support of the majority of the other provinces and those voted on 9 December 1633 (overruling Holland and Overijssel) to break off the talks. While the peace negotiations had been dragging on, events elsewhere in Europe of course had not stood still. While Spain was busy fighting the Mantuan war, the Swedes had intervened in the Thirty Years' War in Germany under Gustavus Adolphus in 1630, supported by French and Dutch subsidies. The Swedes used the new Dutch infantry tactics (enhanced with improved cavalry tactics) with much more success against the Imperialist forces than the German Protestants had done and so gained a number of important successes, turning the tide in the war. However, once its war with Italy ended in 1631, Spain was able to build its forces in the northern theatre of war up to strength again. The Cardinal-Infante brought a strong army up, by way of the Spanish Road, and at the Battle of Nördlingen (1634) this army, combined with Imperialist forces, using the traditional Spanish tercio tactics, decisively defeated the Swedes. He then marched immediately on Brussels, where he succeeded the old Infanta Isabella who had died in December 1633. Spain's strength in the Southern Netherlands was now appreciably enhanced. The naval battle against the Spanish near Dunkerque, 18 February 1639. The Dutch, now with no prospect of peace with Spain, and faced with a resurgent Spanish force, decided to take the French overtures for an offensive alliance against Spain more seriously. This change in strategic policy was accompanied by a political sea-change within the Republic. The peace party around Amsterdam objected to the clause in the proposed treaty with France that bound the Republic's hands by prohibiting the conclusion of a separate peace with Spain. This would shackle the Republic to French policies and so constrain its independence. The resistance to the French alliance by the moderate regents caused a rupture in the relations with the stadtholder. Henceforth Frederick Henry would be much more closely aligned with the radical Counter-Remonstrants who supported the alliance. This political shift promoted the concentration of power and influence in the Republic in the hands of a small group of the stadtholder's favourites. These were the members of the several secrete besognes (secret committees) to which the States General more and more entrusted the conduct of diplomatic and military affairs. Unfortunately, this shift to secret policy-making by a few trusted courtiers also opened the way for foreign diplomats to influence policy-making with bribes. Some members of the inner circle performed prodigies of corruption. For instance, Cornelis Musch, the griffier (clerk) of the States General received 20,000 livres for his services in pushing the French treaty through from Cardinal Richelieu, while the pliable Grand Pensionary Jacob Cats (who had succeeded Adriaan Pauw, the leader of the opposition against the alliance) received 6,000 livres. The Treaty of Alliance that was signed in Paris, in February 1635, committed the Republic to invade the Spanish Netherlands simultaneously with France later that year. The treaty previewed a partitioning of the Spanish Netherlands between the two invaders. If the inhabitants would rise against Spain, the Southern Netherlands would be afforded independence on the model of the Cantons of Switzerland, though with the Flemish seacoast, Namur and Thionville annexed by France, and Breda, Geldern and Hulst going to the Republic. If the inhabitants resisted, the country would be partitioned outright, with the Francophone provinces and western Flanders going to France, and the remainder to the Republic. The latter partitioning opened the prospect that Antwerp would be re-united with the Republic, and the Scheldt reopened for trade in that city, something Amsterdam was very much opposed to. The treaty also provided that the Catholic religion would be preserved in its entirety in the provinces to be apportioned to the Republic. This provision was understandable from the French point of view, as the French government had recently suppressed the Huguenots in their strongpoint of La Rochelle (with support of the Republic), and generally was reducing Protestant privileges. It enraged the radical Calvinists in the Republic, however. The treaty was not popular in the Republic for those reasons. Dividing up the Spanish Netherlands proved more difficult than foreseen. Olivares had drawn up a strategy for this two-front war that proved very effective. Spain went on the defensive against the French forces that invaded in May 1635 and successfully held them at bay. The Cardinal-Infante brought his full offensive forces to bear on the Dutch, however, in hopes of knocking them out of the war in an early stage, after which France would soon come to terms herself, it was hoped. The Army of Flanders now again numbered 70,000 men, at least at parity with the Dutch forces. Once the force of the double invasion by France and the Republic had been broken, these troops emerged from their fortresses and attacked the recently conquered Dutch areas in a pincer movement. In July 1635 Spanish troops from Geldern captured the strategically essential fortress of the Schenkenschans. This was situated on an island in the Rhine near Cleves and dominated the "back door" into the Dutch heartland along the north bank of the river Rhine. Cleves itself was soon captured by a combined Imperialist-Spanish force and Spanish forces overran the Meierij. The Republic could not let the capture of the Schenkenschans stand. Frederick Henry therefore concentrated a huge force to besiege the fortress even during the winter months of 1635. Spain held tenaciously on to the fortress and its strategic corridor through Cleves. She hoped that the pressure on this strategic point, and the threat of unhindered invasion of Gelderland and Utrecht, would force the Republic to give in. The planned Spanish invasion never materialised, however, as the stadtholder forced the surrender of the Spanish garrison in Schenkenschans in April 1636. This was a severe blow for Spain. The next year, thanks to the fact that the Cardinal-Infante shifted the focus of his campaign to the French border in that year, Frederick Henry managed to recapture Breda with a relatively small force, at the successful fourth Siege of Breda, (21 July–11 October 1637). This operation, which engaged his forces for a full season, was to be his last success for a long time, as the peace party in the Republic, over his objections, managed to cut war expenditure and shrink the size of the Dutch army. These economies were pushed through despite the fact that the economic situation in the Republic had improved appreciably in the 1630s, following the economic slump of the 1620s caused by the Spanish embargoes. The Spanish river blockade had ended in 1629. The end of the Polish–Swedish War in 1629 ended the disruption of Dutch Baltic trade. The outbreak of the Franco-Spanish War (1635) closed the alternate trade route through France for Flemish exports, forcing the South to pay the heavy Dutch wartime tariffs. Increased German demand for foodstuffs and military supplies as a consequence of military developments in that country, contributed to the economic boom in the Republic, as did successes of the VOC in the Indies and the WIC in the Americas (where the WIC had gained a foothold in Portuguese Brazil after its 1630 invasion, and now conducted a thriving sugar trade). The boom generated much income and savings, but there were few investment possibilities in trade, due to the persisting Spanish trade embargoes. As a consequence, the Republic experienced a number of speculative bubbles in housing, land (the lakes in North Holland were drained during this period) and, notoriously, tulips. Despite this economic upswing, which translated into increased fiscal revenues, the Dutch regents showed little enthusiasm for maintaining the high level of military expenditures of the middle 1630s. The échec of the Battle of Kallo of June 1638 did little to get more support for Frederick Henry's campaigns in the next few years. These proved unsuccessful; his colleague-in-arms Hendrik Casimir, the Frisian stadtholder died in battle during the unsuccessful siege of Hulst in 1640. However, the Republic gained great victories at other locations. The war with France had closed the Spanish Road for Spain, making it difficult to bring up reinforcements from Italy. Olivares therefore decided to send 20,000 troops by sea from Spain in a large armada. This fleet was destroyed by the Dutch navy under Maarten Tromp and Witte Corneliszoon de With in the Battle of the Downs of 31 October 1639. This left little doubt that the Republic now possessed the strongest navy in the world, also because the Royal Navy was forced to stand by impotently while the battle raged in English territorial waters. In Asia and the Americas, the war had gone well for the Dutch. Those parts of the war were mainly fought by proxies, especially the Dutch West and East India companies. These companies, under charter from the Republic, possessed quasi-sovereign powers, including the power to make war and conclude treaties on behalf of the Republic. After the invasion of Portuguese Brazil by a WIC amphibious force in 1630, the extent of New Holland, as the colony was called, grew gradually, especially under its governor-general Johan Maurits of Nassau-Siegen, in the period 1637–1644. It stretched from the Amazon river to Fort Maurits on the São Francisco River. Soon a large number of sugar plantations flourished in this area, enabling the company to dominate the European sugar trade. The colony was the base for conquests of Portuguese possessions in Africa also (due to the peculiarities of the trade winds that make it convenient to sail to Africa from Brazil in the Southern Hemisphere). Beginning in 1637 with the conquest of Portuguese Elmina Castle, the WIC gained control of the Gulf of Guinea area on the African coast, and with it of the hub of the slave trade to the Americas. In 1641, a WIC expedition sent from Brazil under command of Cornelis Jol conquered Portuguese Angola. The Spanish island of Curaçao (with important salt production) was conquered in 1634, followed by a number of other Caribbean islands. The WIC empire in Brazil started to unravel, however, when the Portuguese colonists in its territory started a spontaneous insurrection in 1645. By that time the official war with Portugal was over, as Portugal itself had risen against the Spanish crown in December 1640. The Republic soon concluded a ten-year truce with Portugal, but this was limited to Europe. The overseas war was not affected by it. By the end of 1645 the WIC had effectively lost control of north-east Brazil. There would be temporary reversals after 1648, when the Republic sent a naval expedition, but by then the Eighty Years' War was over. In the Far East the VOC captured three of the six main Portuguese strongholds in Portuguese Ceylon in the period 1638–41, in alliance with the king of Kandy. In 1641 Portuguese Malacca was conquered. Again, the main conquests of Portuguese territory would follow after the end of the war. The results of the VOC in the war against the Spanish possessions in the Far East were less impressive. The battles of Playa Honda in the Philippines in 1610, 1617 and 1624 resulted in defeats for the Dutch. An expedition in 1647 under Maarten Gerritsz. de Vries equally ended in a number of defeats in the Battle of Puerto de Cavite and the Battles of La Naval de Manila. However, these expeditions were primarily intended to harass Spanish commerce with China and capture the annual Manila galleon, not (as is often assumed) to invade and conquer the Philippines. The revolts in Portugal and Catalonia, both in 1640, weakened Spain's position appreciably. Henceforth there would be increasing attempts by Spain to commence peace negotiations. These were initially rebuffed by the stadtholder, who did not wish to endanger the alliance with France. Cornelis Musch, as griffier of the States General, intercepted all correspondence the Brussels government attempted to send to the States on the subject (and was lavishly compensated for these efforts by the French). Frederick Henry also had an internal political motive to deflect the peace feelers, though. The regime, as it had been founded by Maurice after his coup in 1618, depended on the emasculation of Holland as a power center. As long as Holland was divided the stadtholder reigned supreme. Frederick Henry also depended for his supremacy on a divided Holland. At first (up to 1633) he therefore supported the weaker moderates against the Counter-Remonstants in the States of Holland. When the moderates gained the upper hand after 1633, he shifted his stance to support of the Counter-Remonstrants and the war party. This policy of "divide and conquer" enabled him to achieve a monarchical position in all but name in the Republic. He even strengthened it, when after the death of Hendrik Casimir, he deprived the latter's son William Frederick, Prince of Nassau-Dietz of the stadtholderates of Groningen and Drenthe in an unseemly intrigue. William Frederick only received the stadtholderate of Friesland and Frederick Henry after 1640 was stadtholder in the other six provinces. But this position was only secure as long as Holland remained divided. And after 1640 the opposition to the war more and more united Holland. The reason, as often in the Republic's history was money: the Holland regents were less and less inclined, in view of the diminished threat from Spain, to finance the huge military establishment the stadtholder had built up after 1629. Especially as this large army brought disappointing results anyway: in 1641 only Gennep was captured. The next year Amsterdam succeeded in getting a cutback of the army from over 70,00 to 60,000 accepted over the stadtholder's objections. lifting of the Spanish trade embargoes. While the peace negotiations were progressing at a snail's pace, Frederick Henry managed a last few military successes: in 1644 he captured Sas van Gent and Hulst in what was to become States Flanders. In 1646, however, Holland, sick of the feet-dragging in the peace negotiations, refused to approve the annual war budget, unless progress was made in the negotiations. Frederick Henry now gave in and began to promote the peace progress, instead of frustrating it. Still, there was so much opposition from other quarters (the partisans of France in the States General, Zeeland, Frederick Henry's son William) that the peace could not be concluded before Frederick Henry's death on 14 March 1647. The protracted conflict ultimately cost Spain the Dutch provinces. While scholars propose numerous reasons for the loss, the dominant argument is that it could no longer afford the expense of the conflict. Certainly, both Spain and the rebels spent wealth to finance their campaigns but the latter started to gain increasing advantage. Due to its booming economy, which was mainly driven by Dutch banks and a thriving stock market, the soldiers in the rebel armies got their pay on time. On the Spanish front, the case was dismal. According to Nolan, the troops are usually owed months and in many cases years of back pay and "as a result, they fought with less enthusiasm and mutinied dozens of times during the eight decades of war." The negotiations between Spain and the Republic formally started in January 1646 as part of the more general peace negotiations between the warring parties in the Thirty Years' War. The States General sent eight delegates from several of the provinces as none trusted the others to represent them adequately. They were Willem van Ripperda (Overijssel), Frans van Donia (Friesland), Adriaen Clant tot Stedum (Groningen), Adriaen Pauw and Jan van Mathenesse (Holland), Barthold van Gent (Gelderland), Johan de Knuyt (Zeeland), and Godert van Reede (Utrecht). The Spanish delegation was led by Gaspar de Bracamonte, 3rd Count of Peñaranda. The negotiations were held in what is now the Haus der Niederlande in Münster. The Dutch and Spanish delegations soon reached an agreement, based on the text of the Twelve Years' Truce. It therefore confirmed Spain's recognition of Dutch independence. The Dutch demands (closure of the Scheldt, cession of the Meierij, formal cession of Dutch conquests in the Indies and Americas, and lifting of the Spanish embargoes) were generally met. However, the general negotiations between the main parties dragged on, because France kept formulating new demands. Eventually it was decided therefore to split off the peace between the Republic and Spain from the general peace negotiations. This enabled the two parties to conclude what technically was a separate peace (to the annoyance of France, which maintained that this contravened the alliance treaty of 1635 with the Republic). The text of the Treaty (in 79 articles) was fixed on 30 January 1648. It was then sent to the principals (King Philip IV of Spain and the States General) for ratification. Five provinces voted to ratify (against the advice of stadtholder William) on 4 April (Zeeland and Utrecht being opposed). Utrecht finally yielded to pressure by the other provinces, but Zeeland held out and refused to sign. It was eventually decided to ratify the peace without Zeeland's consent. The delegates to the peace conference affirmed the peace on oath on 15 May 1648 (though the delegate of Zeeland refused to attend, and the delegate of Utrecht suffered a possibly diplomatic illness). In the broader context of the treaties between France and the Holy Roman Empire, and Sweden and the Holy Roman Empire of 14 and 24 October 1648, which comprise the Peace of Westphalia, but which were not signed by the Republic, the Republic now also gained formal "independence" from the Holy Roman Empire, just like the Swiss Cantons. In both cases this was just a formalisation of a situation that had already existed for a long time. France and Spain did not conclude a treaty and so remained at war until the peace of the Pyrenees of 1659. The peace was celebrated in the Republic with sumptuous festivities. It was solemnly promulgated on the 80th anniversary of the execution of the Counts of Egmont and Horne on 5 June 1648. The Dutch Republic made some limited territorial gains in the Spanish Netherlands but did not succeed in regaining the entire territory lost before 1590. The end result of the war therefore was a permanent split of the Habsburg Netherlands into two parts: the territory of the Republic roughly corresponds with present-day Netherlands and the Spanish Netherlands corresponds approximately with present-day Belgium, Luxembourg and Nord-Pas-de-Calais. Overseas, the Dutch Republic gained, through the intermediary of its two chartered companies, the United East India Company (VOC) and the Dutch West India Company (WIC), important colonial possessions, largely at the expense of Portugal. The peace settlement was part of the comprehensive 1648 Peace of Westphalia, which formally separated the Dutch Republic from the Holy Roman Empire. In the course of the conflict, and as a consequence of its fiscal-military innovations, the Dutch Republic emerged as a Great Power, whereas the Spanish Empire lost its European hegemonic status. Soon after the conclusion of the peace the political system of the Republic entered a crisis. The same forces that had sustained the Oldenbarnevelt regime in Holland, and that had been so thoroughly shattered after Maurice's 1618 coup, had finally coalesced again around what was to become known as the States-Party faction. This faction had slowly been gaining prominence during the 1640s until they had forced Frederick Henry to support the peace. And now they wanted their peace dividend. The new stadtholder, William II, on the other hand, far less adept as a politician than his father, hoped to continue the predominance of the stadtholderate and the Orangist faction (mostly the aristocracy and the Counter-Remonstrant regents) as in the years before 1640. Above all, he wanted to maintain the large wartime military establishment, even though the peace made that superfluous. The two points of view were irreconcilable. When the States-Party regents started to cut down the size of the standing army to a peacetime complement of about 30,000, a struggle for power in the Republic ensued. In 1650 stadtholder William II finally followed the path of his uncle Maurice and seized power in a coup d'état, but he died a few months later from smallpox. The power-vacuum which followed was quickly filled by the States-Party regents, who founded their new republican regime that has become known as the First Stadtholderless Period. Dutch trade on the Iberian Peninsula and the Mediterranean exploded in the decade after the peace, as did trade in general, because trade patterns in all European areas were so tightly interlocked via the hub of the Amsterdam Entrepôt. Dutch trade in this period reached its pinnacle; it came to completely dominate that of competing powers, like England, that had only a few years previously profited greatly from the handicap the Spanish embargoes posed to the Dutch. Now the greater efficiency of Dutch shipping had a chance to be fully translated into shipping prices, and the competitors were left in the dust. The structure of European trade therefore changed fundamentally in a way that was advantageous to Dutch trade, agriculture and industry. One could truly speak of Dutch primacy in world trade. This not only caused a significant boom for the Dutch economy, but also much resentment in neighbouring countries, like first the Commonwealth of England and later France. Soon, the Republic was embroiled in military conflicts with these countries, which culminated in their joint attack on the Republic in 1672. They almost succeeded in destroying the Republic in that year, but the Republic rose from its ashes and by the turn of the century, she was one of the two European power centres, together with the France of Louis XIV of France. Portugal was no party in the peace and the war overseas between the Republic and that country resumed fiercely after the expiration of the ten-year truce of 1640. In Brazil and Africa the Portuguese managed to reconquer most of the territory lost to the WIC in the early 1640s after a long struggle. However, this occasioned a short war in Europe in the years 1657–60, during which the VOC completed its conquests in Ceylon and the coastal areas of the Indian subcontinent. Portugal was forced to indemnify the WIC for its losses in Brazil. The success of the Dutch Republic in its struggle to get away from the Spanish Crown had damaged Spain's Reputación, a concept that, according to Olivares' biographer J.H. Elliot, strongly motivated that statesman. In the minds of Spaniards the land of Flanders became linked to war. The idea of a second Flanders –a place of "endless war, suffering and death"– haunted the Spanish for many years after the war ended. In the 16th and 17th centuries the concept of a second or "another" Flanders was variously used while referring to the 1591 situation in Aragón, the Catalan Revolt and the 1673 rebellion in Messina. Jesuit father Diego de Rosales described Chile from a military point of view as "Indian Flanders" (Flandes indiano), a phrase that was later adopted by historian Gabriel Guarda. ^ Clodfelter, M. Warfare and Armed Conflicts: A Statistical Encyclopedia of Casualty and Other Figures, 1492–2015, 4th ed. p. 17. ^ The Dutch States General, for dramatic effect, decided to promulgate the ratification of the Peace of Münster (which was actually ratified by them on 15 May 1648) on the 80th anniversary of the execution of the Counts of Egmont and Horne, 5 June 1648. See Maanen, H. van (2002), Encyclopedie van misvattingen, Boom, p. 68. ISBN 90-5352-834-2. ^ Turner, Barry (2009). The Statesman's Yearbook 2010: The Politics, Cultures and Economies of the World. New York: Palgrave Macmillan. p. 910. ISBN 9781349586349. ^ Jonathan Israel, The Dutch Republic: its Rise, Greatness, and Fall 1477–1806 (Oxford, Clarendon Press, 1995), pp. 159–160. ^ They formed the Burgundian Circle that under the Pragmatic Sanction of 1549 was to be transferred as a unit in hereditary succession in the House of Habsburg. ^ Motley, John Lothrop (1885). The Rise of the Dutch Republic. vol. I. Harper Brothers. Archived from the original on 27 March 2013. Retrieved 10 March 2014. As Philip was proceeding on board the ship which was to bear him forever from the Netherlands, his eyes lighted upon the Prince. His displeasure could no longer be restrained. With angry face he turned upon him, and bitterly reproached him for having thwarted all his plans by means of his secret intrigues. William replied with humility that every thing which had taken place had been done through the regular and natural movements of the states. Upon this the King, boiling with rage, seized the Prince by the wrist, and shaking it violently, exclaimed in Spanish, "No los estados, ma vos, vos, vos!—Not the estates, but you, you, you!" repeating thrice the word vos, which is as disrespectful and uncourteous in Spanish as "toi" in French. ^ Lynch, John (1969). Spain Under the Habsburgs: Spain and America, 1598–1700 Volume 2 of Spain Under the Habsburgs. B. Blackwell. p. 42. ^ Lindquist, Thea L (2001). The Politics of Diplomacy: The Palatinate and Anglo-Imperial Relations in the Thirty Years' War. University of Wisconsin. pp. 98–99. ^ Under the terms of the Will of Philip II the pretended sovereignty over the Netherlands now reverted to Philip III. ^ William Welsh (October 3, 2016). "Trampled Banners: the Battle of Nördlingen (1634) Archived 29 May 2018 at the Wayback Machine". ^ Hendrik Casimir succeeded his father Ernst Casimir as stadtholder of Friesland, Groningen and Drenthe in 1632. ^ Nolan, Cathal (2017). The Allure of Battle: A History of How Wars Have Been Won and Lost. New York: Oxford University Press. p. 73. ISBN 9780195383782. ^ Baraibar, Alvaro (2013). "Chile como un "Flandes indiano" en las crónicas de los siglos VI y VII". Revista Chilena de Literatura (in Spanish). 85. Archived from the original on 26 January 2017. Retrieved 30 January 2016. Bengoa, José (2003). Historia de los antiguos mapuches del sur (in Spanish). Santiago: Catalonia. ISBN 956-8303-02-2. The action of 18 February 1639 was a naval battle of the Eighty Years' War fought off Dunkirk between a Dutch fleet under the command of Admiral Maarten Tromp and the Spanish Dunkirk Squadron under Miguel de Horna. Horna, who had orders to join with his ships Admiral Antonio de Oquendo's fleet at A Coruña, escorted at the same time a transport convoy carrying 2,000 Walloon soldiers to Spain, where they were needed. The attempt to exit Dunkirk was done in sight of the Dutch blockading squadron of Maarten Tromp. A 4-hour battle ensued and Horna was forced to retreat into Dunkirk leaving behind two of his galleons, whilst another ran aground. Despite his success in stopping the sortie, many of Tromp's ships suffered heavy damage, and the Dutch Admiral was forced to abandon the blockade. Therefore, De Horna, after repairing his squadron, was able to accomplish his mission. The Battle in the Bay of Matanzas was a naval battle during the Eighty Years' War in which a Dutch squadron was able to defeat and capture a Spanish treasure fleet. The Battle of Cape St Vincent of 1641 took place on 4 November 1641 when a Spanish fleet commanded by Don Juan Alonso de Idiáquez y Robles intercepted a Dutch fleet led by Artus Gijsels during the Eighty Years' War. After a fierce battle two Dutch ships were lost but the Dutch claimed only a hundred of their men were killed; the Spanish fleet also lost two ships but over a thousand dead. The damaged Dutch fleet was forced to abandon its planned attack on the Spanish treasure fleet. The Battle of Gembloux took place at Gembloux, near Namur, Low Countries, between the Spanish forces led by Don John of Austria (Spanish: Don Juan de Austria), Governor-General of the Spanish Netherlands, and a rebel army composed of Dutch, Flemish, English, Scottish, German, French and Walloon soldiers under Antoine de Goignies, during the Eighty Years' War and the Anglo-Spanish War (1585–1604). On 31 January 1578 the Spanish cavalry commanded by John's nephew, Don Alexander Farnese, Prince of Parma (Italian: Alessandro Farnese, Spanish: Alejandro Farnesio), after pushing back the Netherlandish cavalry, attacked the Netherlandish army, causing an enormous panic amongst the rebel troops. The result was a crushing victory for the Spanish forces. The battle hastened the disintegration of the unity of the rebel provinces, and meant the end of the Union of Brussels. The naval Battle of Gibraltar took place on 25 April 1607 during the Eighty Years' War when a Dutch fleet surprised and engaged a Spanish fleet anchored at the Bay of Gibraltar. During the four hours of action, most of the Spanish ships were destroyed. The Battle of Heiligerlee (Heiligerlee, Groningen, 23 May 1568) was fought between Dutch rebels and the Spanish army of Friesland. This was the first Dutch victory during the Eighty Years' War. The Groningen province of the Spanish Netherlands was invaded by an army consisting of 3,900 infantry led by Louis of Nassau and 200 cavalry led by Adolf of Nassau. Both were brothers of William I of Orange. The intention was to begin an armed uprising against the Spanish rulers of the Netherlands. The Stadtholder of Friesland and also Duke of Aremberg, Johan de Ligne, had an army of 3,200 infantry and 20 cavalry. Aremberg initially avoided confrontation, awaiting reinforcements from the Count of Meghem. However, on 23 May, Adolf's cavalry lured him to an ambush at the monastery of Heiligerlee. Louis' infantry, making up the bulk of the army, defeated the Spanish force which lost 1,500–2,000 men, while the invading force lost 50, including Adolf. The rebels captured seven cannons. The invading force however, did not capture any cities and was soon defeated at the Battle of Jemmingen. "Count Adolf stayed behind, in Friesland, in the battle"
After the Battle of Heiligerlee, the Dutch rebel leader Louis of Nassau (brother of William the Silent) failed to capture the city Groningen. Louis was driven away by Fernando Álvarez de Toledo, Duke of Alba and defeated at the Battle of Jemmingen (also known as Battle of Jemgum, at Jemgum in East Frisia - now part of Germany) on 21 July 1568. The Battle of Lillo was a naval battle that took place during the Eighty Years' War. A Dutch fleet under the command of Lodewijk van Boisot defeated a Spanish fleet at anchor between the fortresses of Lillo en Liefkenshoek near Antwerp. The Spanish lost ten ships which were captured by the Dutch. The Battle of Oosterweel took place on 13 March 1567 near the village of Oosterweel, north of Antwerp, and is traditionally seen as the beginning of the Eighty Years' War. A Spanish infantry division under General Beauvoir defeated an army of radical Calvinists rebels under Jan de Marnix. The prisoners were considered rebels and executed. William the Silent, the Burggraaf of Antwerp, did not allow the Protestants of the city to participate in the battle because he was, as lord of the city, bound by oath to support the Spanish Hapsburg King. The Battle on the Zuiderzee (October 11, 1573) was a naval battle during the Eighty Years' War in which a Dutch fleet destroyed a larger and better-equipped Spanish fleet on the Zuiderzee. Part of the Eighty Years' War, the Capture of Saint Martin was a Spanish naval expedition against the island of Saint Martin occupied by the Dutch Republic and administered as part of the Dutch Antilles. The island, claimed by Spain since Christopher Columbus' second voyage to the West Indies in 1493, lies a few hundred miles east of Puerto Rico. The capture eliminated the presence of Dutch privateers in the island, weakening Dutch privateering and commerce in the Caribbean. The English Fury at Mechelen or the Capture of Mechelen was an event in the Eighty Years' War and the Anglo–Spanish War on April 9, 1580. The city of Mechelen was conquered by Calvinist forces from Brussels which included a large contingent of English mercenaries. The city was brutally sacked and its religious treasures destroyed or plundered. The Islands Voyage, also known as the Essex-Raleigh Expedition, was an ambitious, but unsuccessful naval campaign sent by Queen Elizabeth I of England, and supported by the United Provinces, against Spain during the Anglo–Spanish War (1585–1604) and the Eighty Years' War. Pieter Pietersen Heyn (Hein) (25 November 1577 – 18 June 1629) was a Dutch admiral and privateer for the Dutch Republic during the Eighty Years' War between the United Provinces and Spain. Hein was the first and the last to capture a large part of a Spanish "silver fleet" from America. The Sack of Antwerp, often known as the Spanish Fury at Antwerp, was an episode of the Eighty Years' War. It is the greatest massacre in Belgian history. On 4 November 1576, mutinying Spanish tercios of the Army of Flanders began the sack of Antwerp, leading to three days of horror among the population of the city, which was the cultural, economic and financial center of the Netherlands. The savagery of the sack led the provinces of the Low Countries to unite against the Spanish crown. The devastation also caused Antwerp's decline as the leading city in the region and paved the way for Amsterdam's rise. The Siege of Maastricht was a battle of the Eighty Years' War which lasted from March 12 – July 1, 1579. The Spanish were victorious. The Siege of Mons of 1572 took place at Mons, capital of the County of Hainaut, Spanish Netherlands (present-day Belgium), between 23 June and 19 September 1572, as part of the Eighty Years' War, the Anglo-Spanish War (1585–1604), and the French Wars of Religion. In the spring of 1572, after the capture of Valenciennes by a Protestant force under Louis of Nassau, the Dutch commander continued with his offensive and took Mons by surprise on 24 May. After three months of siege, and the defeats of the armies of Jean de Hangest, seigneur d'Yvoy and Genlis, and William the Silent, Prince of Orange (Dutch: Willem van Oranje), by the Spanish army led by Don Fernando Álvarez de Toledo, Duke of Alba ("The Iron Duke"), Governor-General of the Spanish Netherlands, and his son, Don Fadrique de Toledo, Louis of Nassau's forces, isolated and without any hope of help, surrendered Mons to the Duke of Alba on 19 September. The Siege of Nijmegen was a military engagement during the Eighty Years' War and the Anglo–Spanish War which took place from 17 to 21 October 1591. The Spanish garrison in Nijmegen was besieged by a Dutch and English force under Maurice of Nassau and Francis Vere respectively, which soon surrendered. The Siege of Sluis of 1587 took place between 12 June and 4 August 1587, as part of the Eighty Years' War and the Anglo-Spanish War (1585–1604). On 12 June 1587, Don Alexander Farnese, Duke of Parma (Spanish: Alejandro Farnesio), Governor-General of the Spanish Netherlands, and commander-in-chief of the Army of Flanders, laid siege to the strategic deep-water port of Sluis, defended by English and Dutch troops under Sir Robert Dudley, Earl of Leicester, Governor-General of the United Provinces, and Sir Roger Williams. On 24 June, the bombardment began, and on 4 August, after of 13 days of constant fighting around the walls, the English garrison surrendered. The loss of the English-held port of Sluis revealed the inability of Leicester to assert his authority over the Dutch allies, who refused to cooperate in relieving the town, and led to recriminations between the governor-general and the States of Holland.Other notable English soldiers under Leicester's command were Sir Thomas Baskerville and Sir Francis Vere. In the following months, the Earl of Leicester launched a series of unsuccessful attacks against the Spaniards. In September 1587, Leicester attempts to capture Leiden, but failed, and his plans to capture Enkhuizen and Hoorn, two important ports of West Friesland, also failed. On 16 December 1587, Leicester returned to England.